Spacious accommodations, superb amenities, and a prime location - all of this and more is waiting for you at the SpringHill Suites Sioux Falls. Our hotel is conveniently located near some of the area's best attractions, including Wild Water West, Augustana College, and Sioux Falls Regional Airport which is less than 10 miles away. You'll love our cool retro design and well-appointed hotel suites, which feature comfortable bedding, free Wi-Fi, and pullout sofa beds. Additional hotel room amenities include a work desk and a flat-screen TV, as well as a mini-fridge and a microwave. Kick off your morning with our complimentary hot breakfast buffet, or enjoy a dip in our indoor pool and a workout in our fitness center. Those planning events here in Sioux Falls can make use of our flexible meeting room and terrific group rates; catering and audiovisual services are available as well. 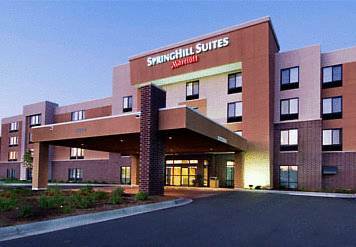 For a truly rewarding hotel experience here in South Dakota, look no further than the SpringHill Suites Sioux Falls. Fiberglass giant arrived in Nov. 1965. Named for his muffler shop's Huth Tube Bender, which could bend a single metal tube into a twisty exhaust pipe. Moved to new Sioux Falls muffler shop in May 2018. ~2 miles from Sioux Falls. The Old Courthouse Museum displays a rare car Teddy Roosevelt rode in a Sioux Falls parade, and a bridge girder driven through a tree by the force of a 1932 tornado. Nipper the Hero Collie is currently in storage. ~4 miles from Sioux Falls. A town's entire supply of ammunition was spent bringing down this cranky giant. ~50 miles from Sioux Falls. Hero the circus elephant finally decided he'd had enough. The town museum displays artifacts of that bloody day. ~52 miles from Sioux Falls.